My name is Sister Mary Katharine Brent. 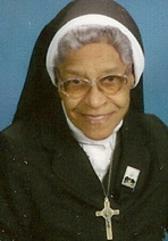 I am celebrating my 68th year as an Oblate Sister of Providence. Born in Alexandria, VA, I was the second of six children of Edward and Julia Johnson Brent. I briefly attended St. Joseph’s, a parochial school staffed by Oblate Sisters. After both parents died, however, I attended elementary and high schools staffed by the Sisters of the Blessed Sacrament (SBS). I established strong friendships with some of my teachers and maintained a lifelong bond with Mother Katharine Drexel, foundress of the order. So strongly was I inspired by the SBS that I began sensing a personal attraction to the religious life. However, it was the providential visit and vocation invitation of two Oblate Sisters of Providence, Sisters James and Louise, that led me to choose the Oblates. Upon graduating from St. Francis de Sales High School in Rock Castle, VA, I began my training with the Oblate Sisters in Baltimore. Teaching assignments from 1st through 8th grades were broad and challenging. What a privilege to serve God’s people in Maryland, Minnesota, New Jersey, Mississippi, Florida, Illinois and Washington, DC.! At 90 years of age I am still in active ministry, tutoring in the Reading and Math Center at our Motherhouse. The special gift God has given me is knowledge of and love for the power of prayer. I deeply love and have a strong sensitivity for people with whom God has called me to serve. Once I’ve been led to embrace them in ministry, I try to maintain communication and give them a permanent place in my prayers. My first commitment was for life, and I have no regrets. I have been blessed with an abundance of graces. In me has been fulfilled the promise of Christ, that leaving all for him and the gospel, a hundred-fold would be mine in this life as I joyously anticipate someday inheriting heaven (Matthew 19:29).